For example, the first line can be read from left to right or by moving from the first square to second line, third syllable (2.3) and then to 1.5 to 2.7 to 4.8 to 3.6 to 4.4 to 3.2. One of the first mathematicians to investigate the knight's tour was Leonhard Euler. 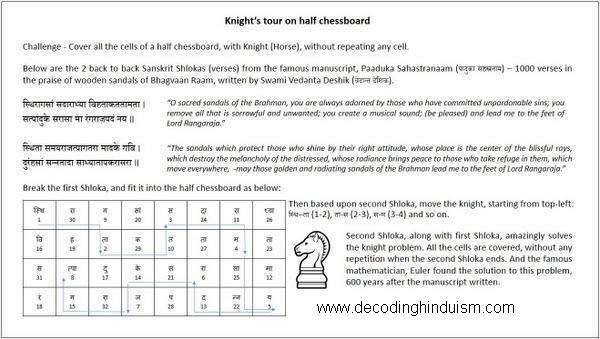 The first procedure for completing the Knight's Tour was Warnsdorff's rule, first described in 1823 by H. C. von Warnsdorff. But Indians solved 600 years before Euler.